Starvation is a severe deficiency in caloric energy, nutrient, and vitamin intake. It is the most extreme form of malnutrition. 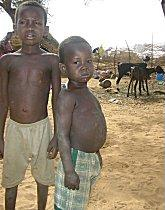 The term inanition refers to the symptoms and effects of starvation. According to the World Health Organization, hunger is the single gravest threat to the world's :public health. The WHO also states that malnutrition is by far the biggest contributor to child mortality, present in half of all cases. The mighty peril is the entire starvation of the country [India] by foreign exploiters and its complete and hopeless dependence on aliens for almost all articles of common use. My whole life has been a struggle with hard realities, from hardships, starvation in England and constant and fierce difficulties to the far greater difficulties continually cropping up here in Pondicherry, external and internal. A signed copy of the Alhambra decree expelling Jews from Spain - Annie Besant: Who can count the hundreds and thousands driven out from home, the broken families, the miseries, the poverty, and starvation intolerable, which marked the expulsion of the Jews and the Moors from Spain. You see somewhere a man who is starving and if you misunderstand karma — as too many of you do, to the shame of India, in a land where this teaching is of immemorial antiquity — you turn aside from that starving man and say that it is his karma to starve and perish; in those hardened heart of yours you use the will of God as a cover for your lack of love. That man’s karma to starve? Aye, and therefore he is starving! But if a Deva guides you to the place where your brother is starving, it is because he would make you the agent of his beneficence to that man whose evil karma of the present moment has been exhausted by his suffering; the Deva thus says to you: “Man your brother man is starving give him the relief it is his karma to receive, and be my agent in carrying out the law. Who can count the hundreds and thousands driven out from home, the broken families, the miseries, the poverty, and starvation intolerable, which marked the expulsion of the Jews and the Moors from Spain. I'm a singer, not a politician, and I think you don't want the two to get confused. It's not OK to be on CNN talking about people starving and then tell the interviewer that your new album is coming out in six months. Waste Food collection -Criss Jami:Feel what it's like to truly starve, and I guarantee that you'll forever think twice before wasting food. Henry B. Eyring:...Since there is enough and to spare, the enemy of human happiness as well as the cause of poverty and starvation is not the birth of children. We can pray for world peace; we can pray to end world hunger and feed the starving children; we can pray to end genocide; we can pray for things to work out or whatever we desperately want or desire. Unless we take the initiative to make it chances are our prayers will not be answered. If we don’t stop the aggressive nations, terrorists, and gangs that attack innocent people, then there won’t be peace in the world. The poor, the weak, and the innocent will go hungry for another decade or longer. If we don’t deliver food to the starving children, they will not have anything to eat and they will starve to death. This is truth and god is truth! Those who create the turbulent environment are evil; they must be dealt with before evil deals with us. To deprive a man of his natural liberty and to deny to him the ordinary amenities of life is worse than starving the body; it is starvation of the soul, the dweller in the body. A. J. Jacobs:I tried the paleo diet, which is the caveman diet - lots of meat. And I tried the calorie restriction diet: The idea is that if you eat very, very little - if you're on the verge of starvation, you will live a very long time, whether or not you want to, of course. When the average American says, “I’m starving,” it is a prelude to a midnight raid on a well-stocked refrigerator or a sudden trip to the nearest fast food restaurant. What influence hath it on the mourner there ! Rests a dead child—she does not weep for it. David Ogilvy, in A good advertisement is one which sells the product without drawing attention to itself. Samantha Power:Zimbabweans are severely malnourished, and deaths from starvation occur even in the cities. The country has not yet suffered nationwide famine only because international donors have stepped in. Too many people are too poor to buy the food that is available or lack land on which to grow it themselves. The real enemy is the international conglomerates that want to profit by feeding the hungry and selling them genetically modified (GM) food. All who are not lunatics are agreed about certain things. That it is better to be alive than dead, better to be adequately fed than starved, better to be free than a slave. Many people desire those things only for themselves and their friends; they are quite content that their enemies should suffer. These people can be refuted by science: Mankind has become so much one family that we cannot insure our own prosperity except by insuring that of everyone else. If you wish to be happy yourself, you must resign yourself to seeing others also happy. Marshall Sahlins:One-third to one-half of humanity are said to go to bed hungry every night. In the Old Stone Age the fraction must have been much smaller. This is the era of hunger unprecedented. Now, in the time of the greatest technical power, is starvation an institution. Reverse another venerable formula: the amount of hunger increases relatively and absolutely with the evolution of culture. One-third to one-half of humanity are said to go to bed hungry every night. In the Old Stone Age the fraction must have been much smaller. This is the era of hunger unprecedented. Now, in the time of the greatest technical power, is starvation an institution. Reverse another venerable formula: the amount of hunger increases relatively and absolutely with the evolution of culture. Nature builds things that are antifragile. In the case of evolution, nature uses disorder to grow stronger. Occasional starvation or going to the gym also makes you stronger, because you subject your body to stressors and gain from them. The king looked sternly upon Thorin, when he was brought before him, and asked him many questions. But Thorin would only say that he was starving. Why did you and your folk three times try to attack my people at their merrymaking? asked the king. "We did not attack them," answered Thorin, "we came to beg because we were starving." "Where are your friends now, and what are they doing?" "I don't know, but I expect that they're all starving in the forest." "What were you doing in the forest?" "Looking for food and drink, because we were starving." "And what brought you into the forest at all?" asked the king angrily. Over the twenty-one-day duration of the fast, Gandhi dropped from 109 pounds to 91 pounds – a 16.5 percent weight loss - or slightly smaller percentage than the men of the starvation experiment would lose in their first three months. With Gandhi starving in jail, legions of Indians fighting for Hitler, and rampant starvation in Bengal, it was near anarchy in India, and no one knew what would happen next. The volunteers of the starvation experiment would have been familiar with Christianity’s extensive ties to fasting. Fasting in the Old Testament occurred frequently, and for a variety of reasons. Swami Vivekananda: As a matter of fact spiritualism cannot progress amidst poverty and starvation. Religion and spiritualism are meaningless to a man who cries out for a piece of bread with a parched throat. It is an insult to a starving man to teach him metaphysics. As a matter of fact spiritualism cannot progress amidst poverty and starvation. Religion and spiritualism are meaningless to a man who cries out for a piece of bread with a parched throat. It is an insult to a starving man to teach him metaphysics. With the sense of possession comes selfishness and under its influence man never thinks for common good, that clears the path for starvation of others. ...in the name of civilizing our country [India] they exploited our country making us poorer day by day. 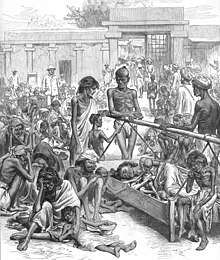 There were perpetual famine and starvation in India. But the British had always been callous to it. Culturally it was a time of stagnation. Poverty and starvation were the common phenomenon in the society. The imperial power invested huge capital in India and made enormous profit. The British looked upon India as a place where capital could hope to maintain a heaven. But paradoxically enough, the Indian masses were rotting in poverty and starvation. Thus a great predicament, surrounded India in the 18th and 19th centuries. They have sucked out blood, they have carried away with them millions of our money, while our people have starved. Twenty years from 1860-1908 were the years of famine. Nearly 29 million people died during famines from 1854-1901. 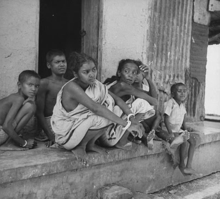 These famines revealed that poverty and chronic starvation had taken firm roots in colonial India. ...amidst wretchedness, poverty and starvation it is too difficult to preach Advaitism and realize the grand dream of Universal Unity...poor must be given bread first and then religion. ...the imperialistic drain of wealth from the backward parts of the globe and its piling up in capitalistic areas of the West that causes poverty and starvation in one part and plentitude in another part of the world. I was dying of starvation, barefooted I went from office to office and was refused everywhere. I learnt by experience what human compassion is. This was my first contact with realities of life; and I discovered it...had no room for the weak, the poor, the deserted.